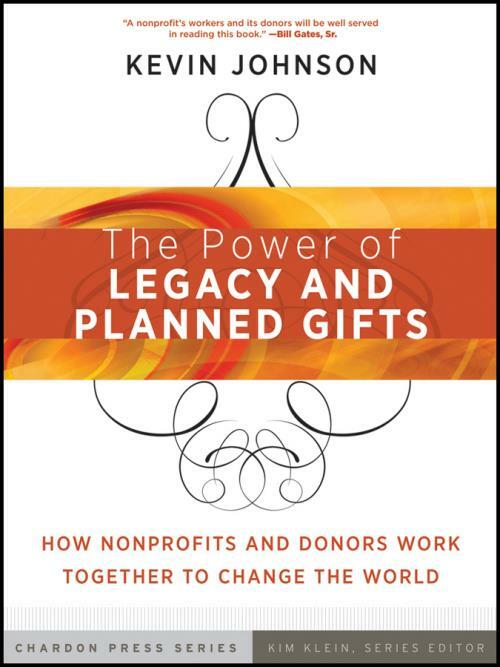 The Power of Legacy and Planned Gifts provides practical knowledge and tools nonprofits need to connect with loyal donors, resulting in a stream of future income that will sustain and advance their mission. Filled with illustrative real–world examples and cases, as well as worksheets to guide the reader, the book details a simple, multi–stage process for nonprofits to build a pipeline of future bequest income and offers donors perspective on making their gifts in a way that will best accomplish their goals. "Kevin Johnson has done a great job making clear the process and the implications of a bequest to a charity. A nonprofit′s workers and its donors will be well served in reading this book." "Regardless of the size, vintage, or mission of your organization, you can use this book. If this is the part of fundraising you have been avoiding, Kevin′s sensible advice can get your team started and get results sooner than you think." "Bequests are the key for small and medium–sized charities to survive and thrive. Kevin clearly shows how board and staff can easily develop the comfort and confidence to build effective relations with donors, and help them tell their stories and express their deepest values through bequests. Oh, that we all had this book years ago!" "Kevin′s insights into donor motivation and the richness of our story have resulted in a substantial increase in planned gifts to our organization." Note: CD–ROM/DVD and other supplementary materials are not included as part of eBook file. List of Exercises, Exhibits, Figures, and Tables. 1 Loyal Donors and the Path to Nonprofi t Sustainability. 2 Transforming Old Habits into New Strategies. 3 Assumptions That Mean Success or Failure. 4 It s Valuable to Make Your Own Plans First. 5 A Reason to Give: Inspiration and the Donor Experience. 6 The Four Steps to Create a Stream of Gifts. 7 Step 1: Setting the Stage for Legacy Gifts. 8 Step 2: Building Trust and Credibility. 9 Step 3: The Tipping Point. 10 Step 4: Putting It to Work: Going Public. 11 Integrating Legacy Gifts into Daily Work. 13 Advisors Moving to Center Stage.